Shakespeare, William. Henry V. Ed. T. W. Craik. London: Arden, 1995. This is a very quick post—a new set of student essays came in yesterday. An alert reader (thanks, Dad!) 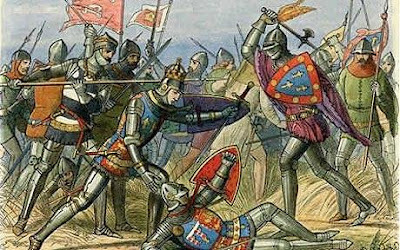 pointed out a link to this article about historians' views on the Battle of Agincourt. It's been a few days since St. Crispin's Day (October 25) and a few hundred years since the St. Crispin's Day speech . . . and a few more hundred years since the actual battle! Yet we're still debating who behaved badly (everyone behaves badly in war—even in Shakespeare's version of the war) and just how badly they behaved. It's been said that the victories write the histories . . . but it helps if Shakespeare is on your side!